Day 4- Lakme Fashion Week continues to enthrall - Wedding Affair var admin_url = "https://weddingaffair.co.in/wp-admin/"
Day 4 of Lakme Fashion Week Winter/Festive 2017 saw a continued exhilaration, at Johnnie Walker – The Journey show. The runway was the canvas to some very talented Gen Next designers like, Asa Kazingmei, Abhishek Paatni and Ajay Kumar. The talented designers also presented a specially curated limited edition capsule collection inspired by Johnnie Walker’s iconic striding man. 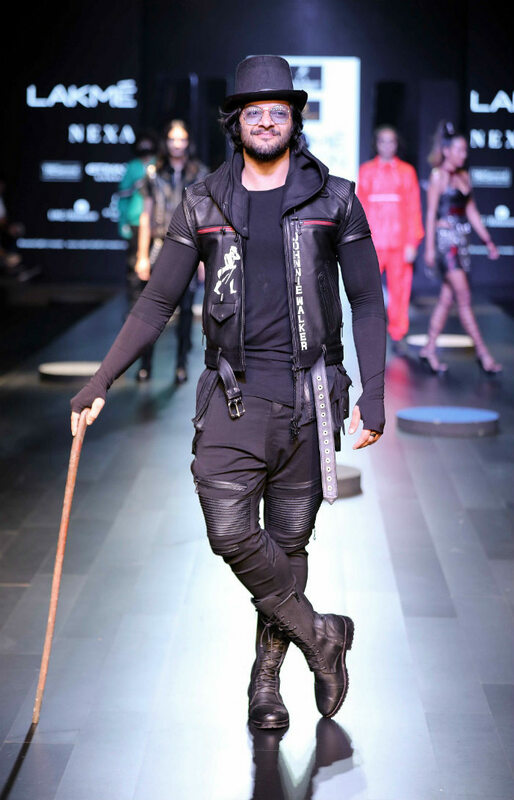 The Show Stopper for the collection Ali Fazal brought the striding man to life in Asa’s stunning execution of progressive fashion. 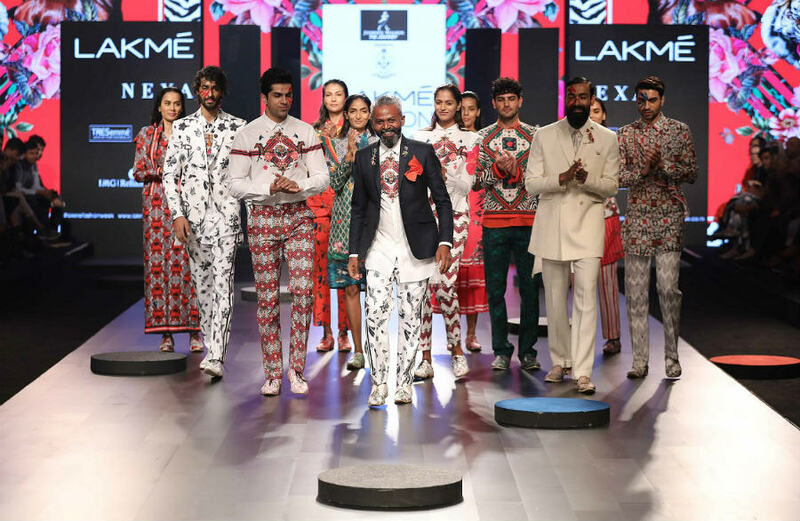 Always being a benefactor of fearless fation this season at Lakmé Fashion Week Winter/Festive 2017 Asa brought ‘Invincible’ haute couture with his customary strong, styling, elements for men’s and women’s wear which were the highlight of the collection. He worked with a fabric base that only comprised of leather and denim. The detailing was done with metal work that featured chains, spikes and fringes. The sharply cut garments in myriad silhouettes offered structural cuts, detailing and were further enhanced with clever embroidery. The models who walked down the ramp wore leather waist coats, corsets, beaded fringed miniskirts, and moulded corset dresses with extended conical shoulder detailing, and warrior like shoulder armour in leather and multiple belts that emerged from various angles ensured that the look was inspired by the furious action but made stylish fashion statements. 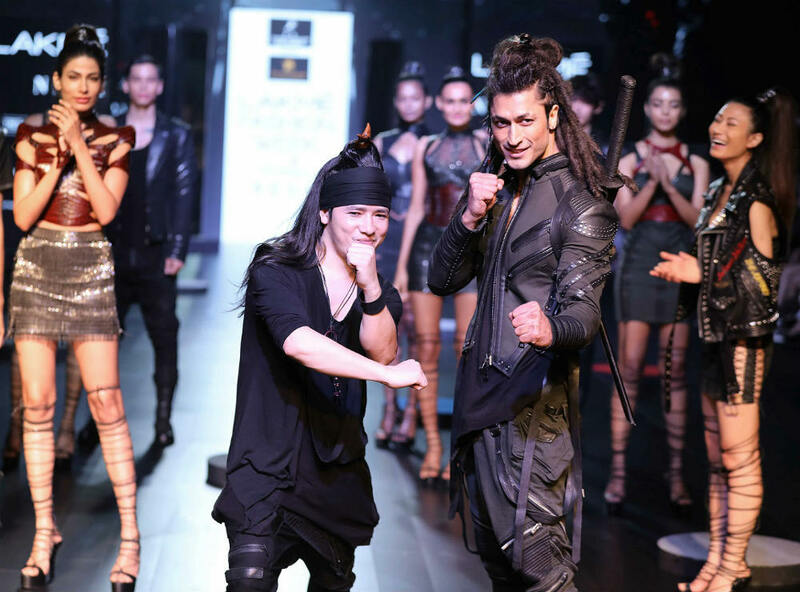 The show ended with the ‘true blue warrior’ Vidyut Jamwal, whose leather /denim jacket, multi pocket pant with zippered detailing and vest proved that he was all ready to fight it out. Abhishek Paatni made a very impressive fashion debut, with his label ‘Zero.Zero’ presenting ‘Street Alpha’ a line of fast paced garments aimed at the contemporary New Age male. He used an assortment of fabrics like suede, polyester mesh, French terry, jersey, cotton and parachute; he ensured that the colour palate was vibrant and full of excitement. The collection featured striking long line Tees, cool hoodies, some relaxed sweat shirts and bombers gave a laid back vibe to the men’s and women’s wear offering with detailing like quilted patch pockets and zippers appearing in a combo of parachute and leather. Finally designer Ajay Kumar presented a colourful fantasy of digital prints. At the Lakmé Fashion Week Summer/Resort 2016 Ajay launched his women’s wear line. Ajay’s ‘Bhu-Svah’ collection was inspired by the beauty, culture, flora, and fauna of India along with a deep fashion rising from within. 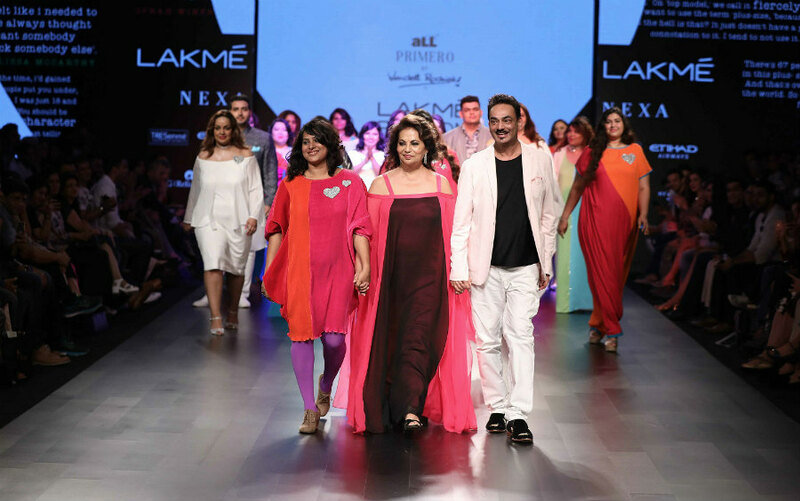 Lakme Fashion Week 2017 saw the second Plus Size show with Wendell Rodricks’s ‘aLL PRIMERO’ at Lakmé Fashion Week Winter Festive 2017. The show broke myths about Plus Size fashion where colour, style and fabrics were concerned and was a rocking sensation on the ramp. 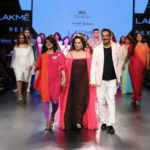 After making their debut at Lakmé Fashion Week last year, aLL – The Plus Size Store chose to collaborate with renowned fashion designer Wendell Rodricks this year for a collection titled aLL PRIMERO which seeks to break popular myths regarding plus size clothing in the fashion industry. Varonica Campabell, India’s first transgender plus size model, opened the show. 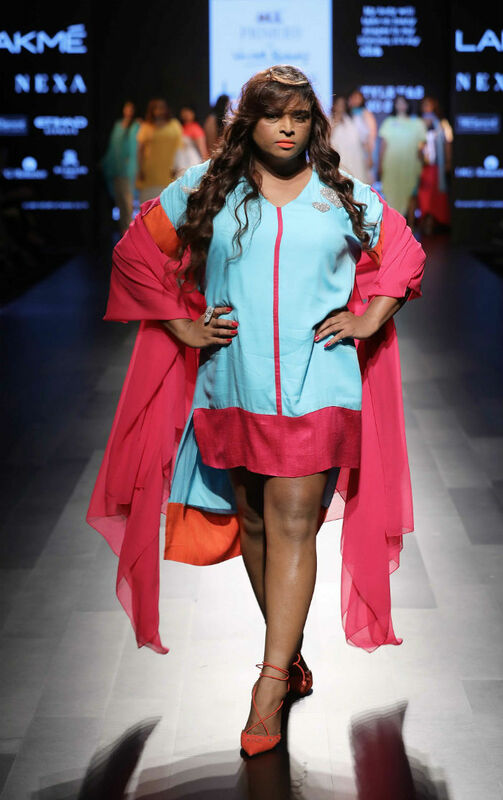 Varonica along with 20 other plus size models who walked the ramp were selected through an audition held in June. The ‘aLL ‘PRIMERO’ collection was a stereotype breaker starting with the colours – white, which has been taboo where Plus sizes are concerned. Then it was neutrals, grey and clothes with great volume that gave confidence to the wearer. The fabrics used were moss crêpe, Lycra, cotton satin, jacquard, polyester georgette, single jersey, Lycra cotton and mercerised Giza for men’s T-shirts. Linen dobby stripes were an interesting part along with over-dyed twill Lycra that was perfect for men’s and women’s jeans. Adding pizzazz to the garments were the ‘Love Your Curves’ appliquéd hearts that brought a fun and humorous element to the collection. The show ended at an high octane show with ace singer and actor of musicals like ‘Jesus Christ Superstar’ Deveika Bhojwani dressed in a glamorous magenta and purple long creation by Wendell Rodricks enteratained the audience with a great rendition of the foot tapping number of the popular hit song ‘Killing me Softly’’. The collaboration between Lakmé Salon’s backstage experts and ace designer Nachiket Barve showcased sheer timeless beauty of Greco-Roman Goddess, and brought alive the theme of ‘Eternal Luminance’. 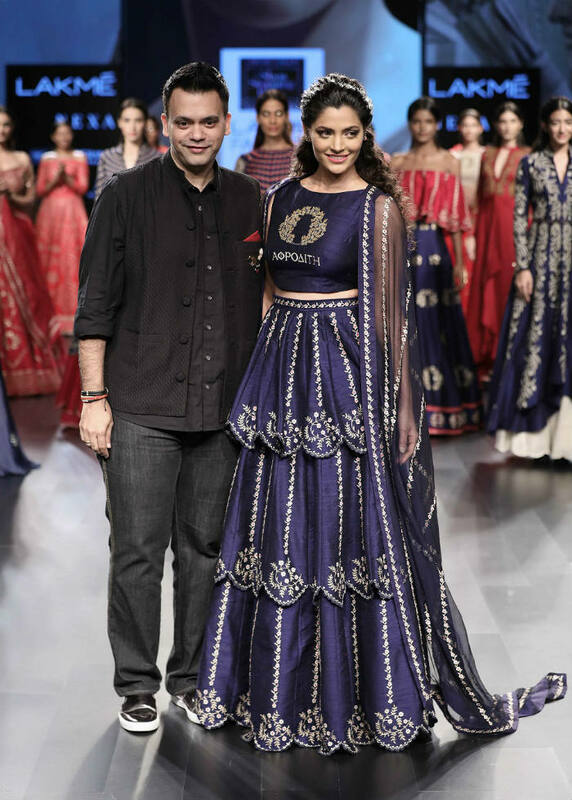 The ‘Lakmé Salon Show Stopping Bride’ Show unveiled the ‘Theia’ goddess collection by Nachiket Barve. Nachiket’s inspirations were the legendary Greek and Roman goddesses Aphrodite, Hera, Gaia, Artemis and Athena. The colour palate started with deep indigo, burgundy, black and then moved to haute colours like Paprika, mustard, splashes of gold, bronze and pewter. 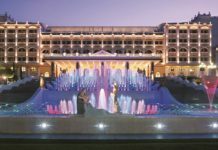 The show was a gorgeous symphony of luxurious lehengas, cholis with cold shoulders and long trailing capes – cowled pants, floor kissing gowns and dramatic asymmetric togas with two-toned loose pants. The embroidery was traditional with appliqués, cutwork, beading, as well as traditional Aegean tie-dye, along with Aari and Zardosi work with the Greek font embroidered with words such as Eternal, Aphrodite, Love, Goddess and Bride on the bodices of the garments. 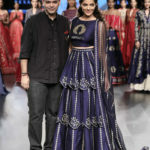 Closing the ‘Lakmé Salon Show Stopping Bride’ Show was the very lovely Siyami Kher, star of the movie ‘Mirziya’ who looked stunning in a deep indigo, layered, scalloped, lehanga, choli with wreath embroidery and a sparkling dupatta. Etihad Airways the world-class airline known for its impeccable inflight service and hospitality presented the glitzy, glamorous, collection called ‘Cosmic Love’ by internationally renowned designer Manish Arora at Lakmé Fashion Week Winter/Festive 2017 to end Day Four. Manish Arora’s collection celebrated his tenth anniversary of showing at Paris Fashion Week that has turned the designer’s name into a global phenomenon. The creations were a visual interplay of colours, styles, intricate silhouettes and designs. Taking the audience on a fast paced fashion journey from Tribal Africa to Aztec prints that reflected Art Deco touches, Manish created geometrics with patchwork and embroidery. Astrology played a major role for embroidery, as shooting stars and golden sunrays appeared on silk crêpe drawstring dresses and cropped denim jackets. Swarovski crystals looked magnificent for paisleys that were emblazoned on burgundy, tunic dresses or velvet gowns. From denim tunics, tiered evening wear, satin quilted bombers, the look progressed to flowing wrap dresses, Dupion silk trouser suits, silver, silk, organza, dresses, waistcoats, sweatshirts and skirts. A variety of fabrics rocketed onto the ramp with denim, organza, boiled wool, raw plastic, velvet, twill, crêpe and Dupion that set the path for the outfits. For added fashion excitement Manish teamed the garments with woven bags and chokers, which were the perfect opulent accessories to complement the garments. 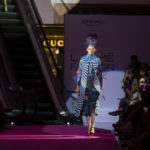 It was a perfect end on Day Four when Etihad Airways presented the breath taking, intergalactic, fashion, odyssey ‘Cosmic Love’ by Manish Arora that transported the audience into the mesmerizing universe of style, elegance and drama. Day 03 of Lakme Fashion Week saw a whole lot of collaborations between brilliant designers and power-houses to create exceptional collections. Designers like Falguni and Shane Peacock joined hands with jewelry designer Farah Khan to serve the world excellence on a runway. Likewise, ‘Caprese” bags also collaborated with ‘Jodi Life” for a fun and flirty collection. Many such collaborations made the third day of LFW 2017 quite an enthralling event.